Since announcing it as part of our Uncharted 4 Multiplayer road map back in May, one of the most common questions we get is: what’s in store for co-op? Well, today I’m excited to give you a first look at Uncharted 4: Survival, our new cooperative and solo mode that will make its public hands-on debut at PlayStation Experience next week and launch in mid-December. But this is just a small taste of what to expect when Survival launches next month. To see more, be sure to check out IGN’s exclusive coverage and extended gameplay videos. And if you’re attending PlayStation Experience next week, come see us at the Uncharted 4: Survival booth to try out the mode for yourself. OH MY. PlayStation Experience 2016 IS next week. Time flew by. This looks like a lot of fun. SWEETNESS. Pretty awesome. I wonder how many gots awards you guys win? Is couch co-op possible for this mode? A zombie horde mode…really? Why not just to Un-karted. I would be more likely to play that. Seriously…do that. Sorry to break it to you but the universe doesnt revolve around you. The fact that you dont like horde modes is irrelevant to the other players and the development team. You haven’t even tried it so your opinion is even more invalid. Hmmm damn it i guess i need to install Uncharted 4 again thank god i have the disc version. I know in this day in age split-screen is almost dead but I would definitely buy this if it has split-screen. UC4’s MP was pretty barebones when released but I appreciate the work put into beefing it up as Ive spent countless hours with it. If only they took the time and include the mystical thingy in the story mode like the previous 1-3 did. It wouldnt be so boring. Was hoping to see mermans and kraken like stuff, much to dissapointment. Best of luck at The Game Awards. In my opinion nothing comes close to Uncharted 4! Any news whatsoever on co-op adventure/story mode? Even a confirmation of it’s existence? Maybe you mistaken that idea. Don’t think a co-op story mode was discussed. It was always just a co-op horde mode similar to previous games. If there was talk of a story mode then I want to see it. Are we going to get anymore information about registration hours? The only thing I can find in my confirmation email is “You may pick up your badge during registration hours in the Anaheim Convention Center”. Is there going to be an “adventure” co-op mode like in the previous games? Those were really fun. Will there ever be new MP trophies added to the game? BOOM this is my favorite part of UC the co-op mode and we have all weapons and mystical no sidekicks though? and how may can play co-op is it still 4 man teams or 5? I’ll be watching video’s later. All weapons will be present, as will most of the mysticals and gear seen in competitive mode. For coop, it will be up to 3 man teams. Though it can be played solo or two player as well. In Solo mode, we pair you with an AI buddy who can revive you and is a dependable partner in combat. Yes, Survival Mode will have it’s own trophy set. Stay tuned for more information on that. I hope no… DLC online trophy is pain after some month. So looking forward to this I can’t wait!!!!! Is nobody else more interested in hearing about single player DLC? I don’t care much about multiplayer, but if they were to release a single player DLC add-on for Uncharted 4 I’d buy it on day 1. So many great games totally neglect the single player experience for multiplayer DLC (I.E. GTA V, Uncharted 3). The Last of Us received a great DLC single player experience, so why not Uncharted 4? Not just more interested…..ONLY interested. It’s been 6 months since the game released now. It’s been 8 months since the game went gold. Not a peep as far as the single player DLC though. My guess is it will be about Nate and Sam before the prison incident. Nice! 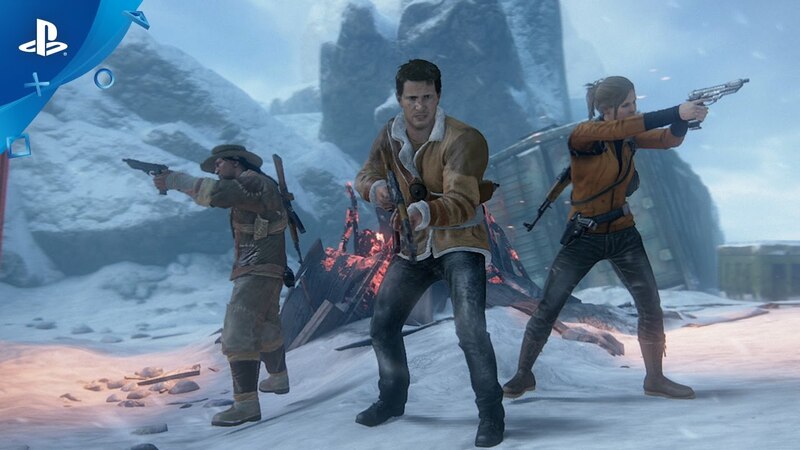 I miss playing Uncharted co-op with my friends! Also cool to see Train Wreck make a return. Are we getting any more classic maps? I’d love to see some of the more vertical maps make a return, like Yemen and Museum. I need to go back a few months and find the post where i said that the next map you guys added was going to be the snowy trainyard. damn was i right on that. Gotta stop being predictable. No complaining but the multiplayer trend you’ve had going since 3 is introduce new stuff and maps, then add maps from Uncharted 2. Here you’re doing it again. U2 was a fantastic game but you guys don’t actually move forward much. Idk if anything is gonna get me back into the MP after the first patch you guys put out made it pay-2-win but i guess i’ll load the game back up whenever that single player DLC happens, if it happens. Can you play this mode without plus and will there be a future update for competitive multiplayer bots? It looks awesome by the way. Yes, you will be able to play our Solo mode without PS Plus. In Solo mode we spawn an AI buddy to fight alongside you. Yes, finally!!! I put tons of hours into co-op on Uncharted 3, I’m so glad to see it come back. Outside of the single-player campaign, this mode was my biggest reason for buying Uncharted 4! Can’t wait to finally get a crack at it. Finally!! I’m so glad you guys got around to including survival. It was one of the most fun modes in U2 and U3 for my friends and me. It looks like you’re including a remastered version of the Train Wreck map from U2. Is that right? For what it’s worth, I would be stoked if you update the game with other remastered maps from the previous games. There were so many great ones, like The Plaza, The Fort, The Sanctuary, The Airstrip, Highrise, The Flooded Ruins, The Museum, Oasis, Yemen, etc. They’re pretty much all great. So many good memories, but with the polish available on the PS4… wow. Great potential there. Really happy you listened to a lot of your fans by including boss waves into your survival mode! Glad you’re excited! We’re just as excited to release this mode for everyone to play. The melee from singleplayer has been a blast to play with in Survival. We wanted to be conscious of how players will play this mode, so it was important to ensure that whether you have half-an-hour or a full day to play, you can enjoy and achieve something in Survival mode. devs are killin me, finishing 50 levels is a gigantic slice of time. Need smaller tiers like 10-20-50.
super high percent of peeps are just gonna bail before 50 or they won’t bother if the rewards are ransomed til the very end. Good news – the 50 waves are actually split into 10 stages that are 5 waves each so that you can play in smaller increments. A typical stage length will be anywhere between 15-20 minutes. So its basically GoW4’s Horde Mode, right? Even the 50 level thing. cry me a river kid. Finally. I’ve been eagerly awaiting the new Co-op survival modes. Thank you!!! It’s about time… been looking forward to co-op since release. Now maybe I can convince my buddies to get the game again so we play some UC together. QUESTION; Will there be other co-op modes or is this the only mode we’re getting? Do you need the season pass in order to play Survival mode? So excited for this! I love the support the this game. Hope to see it supported even years down the road. Not gonna happen…when ND is done with their DLC roadmap.UC4 will be forgotten…the real support that UC4 needs which is punishment for cheaters and balance well ND dont give a flying f about it so imagine a year from now. It took a while but FINALLY, the one mode my friends are waiting for. This survival mode is the ONLY reason we all held back on purchasing Uncharted 4. We spend so many hours with U2 and U3 playing this and each time was a joy. That feeling you get when you complete it on the hardest difficulty is just truly rewarding, especially when playing with random players. 50 waves?! This is friggin awesome! Not to mention that so many other elements have been thrown in the mix to make it that much harder. OMGGG….this is going to be an awesome Christmas! Co-op adventure would be totally awesome if you were to bring that out eventually as well, ND. Really glad for finally getting some news on the co-op and the trailer was awesome,it looks awesome…the idea to put the pirate captains from the story as bosses was incredible but I already see you guys tried to make the co-op like zombies from CoD…thats the ND I know,instead of making UC into what made it good,no…y’all wanna keep copying another games instead of doing your own thing.Oh well I hope its as good as it looks,at least something close to how good UC2 co-op arena was and also I hope for some co-op adventure. Oh and bad move adding trophies…nobody needs online trophies. BTW where’s Alcazar and Jameson?….both should’ve been available to play online with since the beginning. I’m personally very happy we are finally getting additional online trophy sets. If you don’t like them, dont go for them. They don’t prevent you from platnuming the game, so stop discouraging trophy additions for people who want them… like me and many many others. Naught Dog has always added MP trophies ever since Uncharted 2. Plus you don’t need them for the platinum. The only reason you might have an issue is you won’t be at 100% anymore which I totally get. Who knows, the trophies might be easy with only a couple difficult ones. Oh yeah forgot to mention…Train Wreck really?…I’m glad to see another UC2 map back but of all great maps on UC2 like Temple,Plaza,Sanctuary…you guys come with Train Wreck?…starting to lose faith in you ND. Please allow us to play as villains in Survival mode! While it was fun to play as Donut Drake, Chloe, Sully etc, we’ve always wanted to play as villains. I don’t see what’s the harm in allowing this. Obviously it wouldn’t make sense in Story Mode or whatever but this would awesome in Survival mode. FINALLY! Was getting tired of carrying entire teams literally every game in PVP so I stopped playing way back in August. Now I’ll have an excuse to pick up the game again soon. Naughty Dog have gone from a developer that constantly amazed me to a developer that constantly disappoints me. Uncharted 4 single player was very good but the multiplayer part of the game has been so disappointing, shortage of game modes, shortage of maps, no co-op at launch and now 8 months later still no co-op adventure (something that was so unique to Naughty Dog), and this after a game that was delayed on more than one occasion. This is the last time I pre-order, or purchase a season pass for a Naughty Dog game, without knowing exactly what I am going to get for my money. Should have realised what Naughty Dog were turning into when Uncharted 3’s final “map pack” contained a single map. it was one of the best things on uncharted 2/3 will we have it on U4? By playing solo without PS Plus does that mean it can be played offline as well by that description?? ?